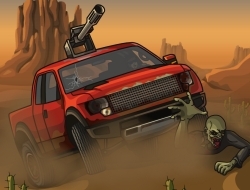 You can never be to ready for a zombie apocalypse, so in this car game you will get the chance to see for yourself how it is to be one of the few survivors. Due to your ingenuity you can reach the helicopter landing zone, by constantly earning money and improving your car, so no zombie and no bumps in the road will be able to stop you. Once you have enough money you can go ahead and buy other cars, that will be a much better escape vehicle. Try to smash the zombies for extra money and constantly upgrade your cars engine and transmission, along with filling up the fuel tank and mounting a machine gun on top of it to destroy any zombie ahead. Use the arrow keys to drive the car and X to activate the boost. Earn to Die 6.00 between 0 and 10 based on 2 votes.